Egypt's Violent Gov't Turns Off The Entire Internet! Egypt’s Violent Gov’t Turns Off The Entire Internet! 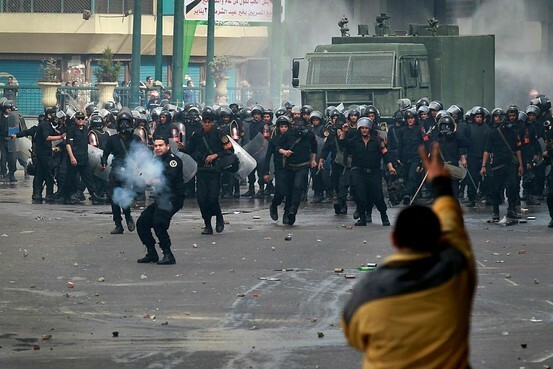 id=”attachment_1578″ Police attack Egyptian protestors with tear gas. The Egyptian government is at war with it’s people. Following the month-long mass protests in Tunisia that led to the ousting of President Zine al-Abidine Ben Ali, Egyptian citizens took to the streets in defiance of Egypt’s ruling party, globally recognized for human rights violations. After the Egyptian riots began trending on Twitter and Facebook, the Egyptian government blocked both sites in an attempt to prevent it’s citizens from sharing photos and news of the police brutality being used across the state. Keep in mind, Egyptian police have routinely jailed citizens for simply blogging over the past decade. When Egyptians began using third-party sites to send messages and pictures, the government responded by shutting down the entire internet. Not hyperbolically speaking. They have actually turned off the internet in the entire country, along with all cell phone service. The Wall Street Journal notes that President Obama, who is in support of the protestors, expressly communicated the danger in attempting to isolate the Egyptian people via a technological blackout. Egyptians woke Friday to find Internet access shut down in much of the country and to the sight of heavy deployments of black-clad, truncheon-wielding riot police, as the country braced for massive antigovernment protests on a scale unseen in decades. Authorities also shut down cellphone services throughout much of the country. In shutting down Internet communications and sending security forces to violently confront protesters, the government of President Hosni Mubarak was taking two steps the Obama administration in recent days explicitly asked it to avoid. In addition to the communications restrictions, the government also tookn steps to limit protesters’ ability to move around, closing the city’s subway system. Egyptian security officials said Nobel Peace laureate Mohamed ElBaradei is under house arrest. The prodemocracy leader returned to the country Thursday night after a month abroad, declaring he was prepared to lead the opposition to a regime change. When he joined protesters Friday after noon prayers, police fired water cannons at him and his supporters. They used batons to beat some of Mr. ElBaradei’s supporters, who surrounded him to protect him. A soaking wet ElBaradei was trapped inside a mosque while hundreds of riot police laid siege to it, firing tear gas in the streets around so no one could leave. Tear gas canisters set several cars ablaze outside the mosque and several people fainted and suffered burns. Heartbreaking and terrifying! We take so many of our freedoms for granted here in America. Our thoughts are with you, Egypt. How would you feel about your government turning off the internet to silence you?